Heart, being a vital organ that keeps us going, is basically a center of almost all the things we do, be it moving, walking, running, exercising, or burning calories. By monitoring the heart rate one can reach their fitness goal easily and healthily. Which Is Better, Fitbit Alta Hr Or Charge 2? WATER RESISTANCE	 Alta hr is water-proof and can be submerged to 10 meters. This Fitbit watch is not swim-proof, so you can’t go swimming with the watch on the wrist. Charge 2 is also water resistant and can be submerged to 10 meters. Similar to the Alta hr, charge 2 is not swim-proof. FLOORS CLIMBED	 It does not measure floors climbed. Charge 2 features an altimeter that helps you keep a track of floors climbed. CALLER ID & MESSAGES	 With Fitbit Alta hr, you can view the caller ID and massages once you link it to your smartphone. It also displays text notifications. This feature does not distract you during activities but remains updated in case you need it. Charge 2 also displays the caller ID, messages, and text notifications. Although it is a good feature, it never distracts you when you are doing any activity. Just like Alta hr, it stays updated in case you need it. REMINDER TO MOVE	 The Alta hr features a reminder to move feature that allows you to set the reminder for 250 steps every hour. The reminder can be set according to your schedule. It can also be set to ‘do not disturb’ mode when you are busy in a meeting or during sleeping time. The charge 2 also has a reminder to move feature just like Alta hr. It reminds you to walk at least 250 steps each hour. Similar to the Alta hr, it also allows the user to set the reminder or put it on ‘do not disturb’ mode when you are sleeping or busy in some other work. DESIGN	 It has a metal body with a slim and sleek design having a width of 0.6 inches. The Fitbit Alta hr has an elastomer band with an OLED display of 1.4 inches. The dimension of this watch is 1.6 x 1.3 inches with a weight of 0.8 ounces. This fitness watch is 25 percent bigger in size as compared to the Alta hr. Comparatively more noticeable when worn. Charge 2 also has a metal body with an elastomer band. It has a larger display. The dimension of charge 2 is 8.6 x 0.5 inches with a weight of 1.12 ounce. SLEEP TRACKING	 Alta hr features a sleep tracking system to measure the sleeping time and also keep a tab on the quality of the sleep, which is linked to your general health. Fitbit Alta hr also measures the sleep stages to tell how much you have light, deep or REM sleep. Charge 2 also has a sleep tracking system that works to measure the time of sleeping and track the quality of sleep. Just like Alta, charge 2 has a feature of measuring the sleep stages and indicates how much one spend in light, deep or REM sleep. Fitbit charge 2 offers relax guided breathing sessions that help people calm their body, which reduces the anxiety, stress, and blood pressure. DISPLAY	 It displays a vertical view with useful stats and information about the daily activities and how well you are performing to reach the goal. Whereas the Fitbit charge 2 has a larger OLED display. It displays heart rate, time, burned calories, distance, steps, active minutes, floors climbed, alarm, text notifications, and caller ID. COLORS AVAILABLE	 Alta Hr is available in various colors including indigo, coral, blue grey, lavender, and black. Rose gold and stainless steel color are also available for an extra 30 dollars. Charge 2 is available in teal, plum, blue, and black. On the pay of extra 30 dollars, it can be purchased in rose gold and stainless steel color. 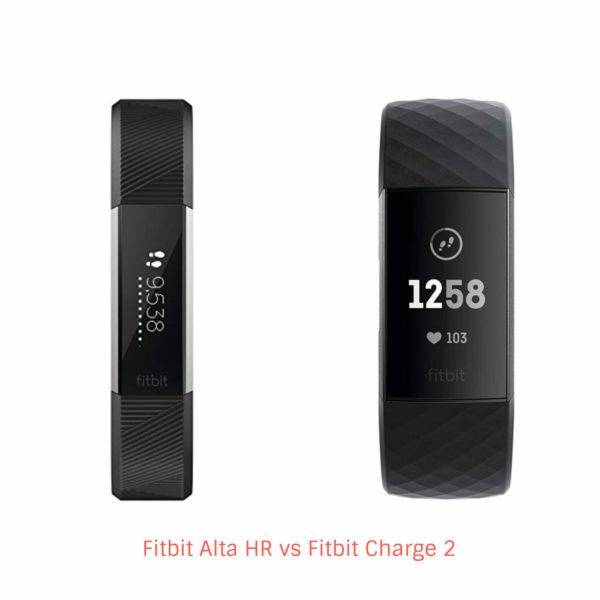 With the above-mentioned Fitbit Alta HR vs Charge 2 comparison, we can easily tell that both are good for fitness fanatics who want to keep a tab on their intensity and activities by measuring heart rate. Reaching the goal within a preset time can be done using the Fitbit watches. 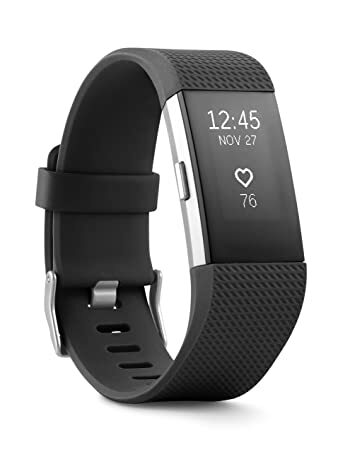 The Fitbit charge 2 vs Alta hr shows that gone are the days when you need to wear a chest strap to measure fitness level and cardiovascular health. All in all, Fitbit is a renowned brand that has been helping people tracking the fitness and heart health. Alta Hr and Charge 2 are one of the popular trackers of Fitbit and both are quite useful. According to the Fitbit Alta HR vs Charge 2 comparison, both watches are quite similar in terms of features. If you are looking for a sleek and lightweight fitness tracker, then Fitbit Alta HR is a perfect choice. It has a good battery life as well. On the other hand, charge 2 has more features than Alta hr, so if you want more features and detailed information about your activity, and ready to spend more cash, then you can go for Fitbit charge 2. 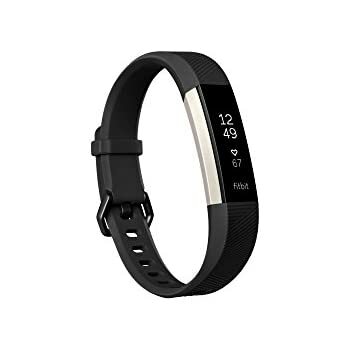 The Fit bit Alta HR is one of the best products of Fitbit that is quite popular among the fitness fanatics. It has a lot in store that makes it a worth buying fitness tracker. When you are up for buying a fitness tracker, the first thing you check is the features of the product you are willing to buy. The Alta HR is a fantastic heart rate monitor that does the work efficiently. By tracking the heart rate, it helps to find the intensity level to reach the goal. Moreover, it measures calories burned. It also has a feature called reminder to move, which means you can set the remind mode according to your schedule or turn it on ‘do not disturb’ mode when you are busy in any meeting or other work. Furthermore, the Fitbit Alta HR automatically tracks distance, step, active minutes, calories burned with a long-running battery. The battery life of the Fitbit Alta hr lasts up to 7 days, which means you can use the watch for 7 days once you charge it. It also features a sleep tracking system powered by PurePulse heart rate. It keeps a tab on the time you spend on light, deep, and REM sleep. This fitness watch tracks the sleeping time and quality of sleep. The Alta HR has a sleek and fashionable design with a metal body and elastomer band. It is a lightweight fitness tracker having a weight of 0.8 ounces. The dimension of this Fitbit tracker is 1.6 x 0.6 x 1.3 inches. The first thing to notice about the Fitbit charge 2 is the rating on the Amazon page. It has earned the tag of Amazon’s choice because of the maximum number of purchases, price, and quick shipping. All in all, it has gained popularity as fitness enthusiasts like the performance, quality, and features. Being a Fitbit product, it is built with a high-quality to measure heart rate. It measures continuous heart rate all thanks to the PurePulse technology. Charge 2 keeps a tab on all day activities like distance, steps, active minutes, and floors climbed. Moreover, it gives a reminder to move, 250 steps each hour. The best part of the ‘reminder to move’ feature is that you have the liberty to set it according to your schedule and you can also set it to ‘do not disturb’ mode when you do not want the device to remind you. It also measures the calories burned throughout the day. The guided breathing session is good to calm the body and reduce stress and anxiety. This fitness tracker measures the sleep stages and the quality of sleep. Furthermore, the charge 2 has a battery life that lasts up to 5 days, so you need to charge it after every 5 days to keep using the outstanding features. The dimension of charge 2 is 9.9 x 0.9 x 0.5 inches. It weighs 1.28 ounces. The Fitbit charge 2 is available in six different colors. In this article, we discussed the two best fitness trackers by Fitbit. The Fitbit Alta hr vs charge 2 highlights the similarities and dissimilarities between both fitness trackers. The Fitbit watches are stylish and fashionable and perform really well. Both fitness trackers measure heart rate and also keep a tab on calories burned throughout the day. According to the Fitbit Alta hr vs charge 2 comparison, charge 2 has more features. If you want more features and willing to spend more, then charge 2 is good for you. On the other hand, Alta hr is lightweight with a sleek design with a good battery life.